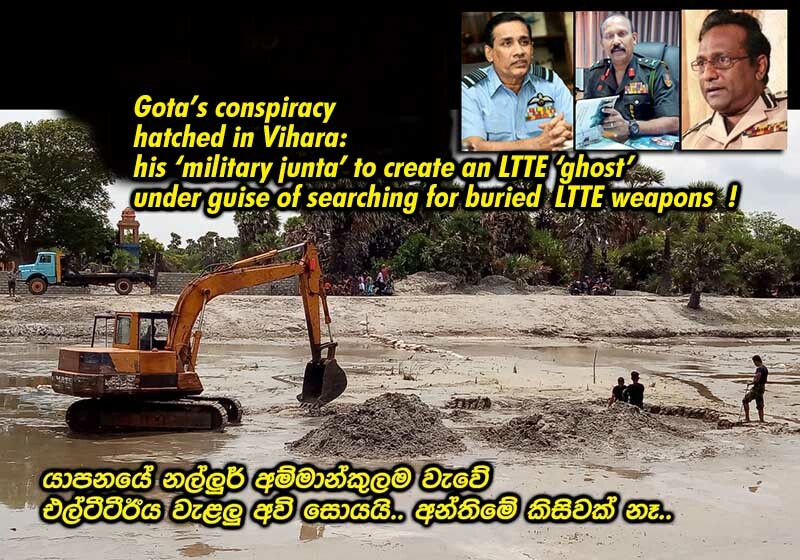 LEN - www.lankaenews.com | Gota’s conspiracy hatched in Vihara: his ‘military junta’ to create an LTTE ‘ghost’ under guise of searching for buried LTTE weapons ! Gota’s conspiracy hatched in Vihara: his ‘military junta’ to create an LTTE ‘ghost’ under guise of searching for buried LTTE weapons ! (Lanka e News -31.July.2018, 11.45PM) The search for the arms and gold hidden by the LTTE which is being carried out by digging at various places. Though nothing was found these operations are well planned and conducted by the pensioned military major General junta who are now moving heaven and earth to propel Gotabaya to power. During the initial stages following the good governance government coming into power , based on spurious information employing various individuals searches for weapons and gold of the LTTE were conducted in the North. It is specially noteworthy , this is now a futile routine operation so much so it is being carried out weekly. The latest of this series of excavation was that conducted in the Ammankulam tank , Nallur , Jaffna on the 29 th by the security division on the information received that there was a large quantity of LTTE weapons there. However nothing was found. The previous week another search was conducted in the Maniyathottam tank in Jaffna town , based on information received that an LTTE plastic barrel of war equipment was thrown into that tank . There too nothing suspicious was found. There is a most perplexing side to this racket : This area was captured by the army in 1996 during the period when Ratwatte was the defense minister , and not after the war was won in 2009. The information which was not received during the 19 years -from 1996 until 2015 that is until the Rajapakses were thrown out lock ,stock and barrel from power , is most intriguingly being received only now. When it was probed who these informants are ,…… That was the time Gotabaya had fled to America in fear of the war to work in Seven Eleven shops. Following the conclusion of the war in 2009, five international organizations including Dash, Hello Trust , Sharp, as well as the SL army cleared the entire war zone - North and East of the claymore mines , killer bombs, tank destruction bombs which were buried by the LTTE , and now there remains only a small 27 kilometers area to be cleared. According to that team , the entire area can be cleared and completed by 2020. While this is the true position , every week digging is being done in vain for hidden weapons despite the fact the team which was digging in search of bombs hidden one inch beneath could not find. In the end nothing is found . Yet no punishment has still been meted to any informant who is providing false tip offs. Discovering two bombs buried in the zone where a war raged for 30 years is understandable. . Bombs which were left behind during the second world war are still being found in Europe. Nevertheless , one need not be a war specialist to realize it is a waste of time, money and a direct sabotage activity , to go on excavating the tanks based on mere spurious information , only to finally conclude , nothing could be found. The masterminds behind the search for LTTE weapons inspired by bogus tip offs .. The masterminds behind these sabotage stupid activities are none other than the retired ‘ military junta’ of Gotabaya. Gota’s ‘military junta’ is conducting these excavations employing their henchmen giving massive media publicity only to instill the fear in the minds of the people that ‘the LTTE is rearing its head again’. The other lie they are propagating simultaneously is , the forces will be evacuated from the north. The army commander of the north in response to that recently said , no camp of the forces will be withdrawn , neither are the forces going to be trimmed down in the north. Gota’s ‘military junta’ has formed a new organization under the name ‘ Hela Jathika Bala Muluwa’ . The meeting of this group which was held at Sambudhaloka Vihare , Lotus Road , Fort on the 3 rd, was joined in by retired major general Kamal Gunaratne alias Handikadal Kamal ,retired Rear Admiral Sarath Weerasekera , former air force commander Roshan Gunatileke and Elle Gunawansa Thera a notorious culprit who is accused of collecting large sums of cash from the Chinese , and was exposed openly by New York Times. This abominable group at the meeting discussed how to use the LTTE ‘ghost’ to achieve their deadly and despicable goals , and the excavation of tanks for LTTE weapons drama is an outcome of the conspiracy hatched at the discussions. Military Junta has already made Gota the president ! The military junta has planned and plotted not only to topple the good governance government but even to crush the Lotus Bud opposition , with a view to reinforce its own strength. Nevertheless , the Lotus Bud leaders Basil , Welgama and Vasu who are working within the Democratic framework have started their campaign overtly and openly against the pressures exerted by the ‘military junta’. ‘From that side , a Prabhakaran is being demanded, from the South a Hitler is being demanded. Then where is the country headed ? In that event can the people live? Can you sleep? Welgama openly questioned. Vasu too pointed out in public ‘ it is the need of the retired military officers to form a military government’ . The major generals – the chiefs of Gota’s military junta treating the lower rank officers and clashes resulting thereby have also become a common scene . These military junta members accustomed to their characteristic swelled headed ways disregard the lower officers. Consequently one major is already disillusioned with the military junta of Gota.